Astonishing and ever changing landscape is the reason that the Laugavegur Ultra Marathon makes it to many lists of top 10 trail races in the world. Mountains, hot springs, snow, ice, sand, grass, rivers and forest are all part of this multi-terrain course. Unpredictable weather and various conditions of this challenging course make it hard to know what to expect and how to prepare. Here are some advices from Running in Iceland. We hope that if this is your first time running the Laugavegur Ultra Marathon that you will find some of the information useful. How to get to the start in Landmannalaugar? Option A :Take the race bus the night before the race. The race bus departs late at night from Laugardalur in Reykjavik to the start of the race in Landmannalaugar. This is probably what most runners do. You sleep in your own bed (or a comfortable bed) until it‘s time to leave for the race. And you can eat whatever you are used to the night before the race. However,you only get around 3 or 4 hours sleep and have to sit in a bus for about four hours. Option B: Spend a night in Landmannalaugar. You can arrive the day before the race in Landmannalaugar and spend the night either in one of the huts there ot the camping area. You will need to book a bed in the hut in advance as it is usually full during summer. A bus goes daily from BSI bus terminal in Reykjavik. You could also find someone to drive you, but please note that you need a specially equipped car as the roads are gravel and there are rivers to cross. Bring your earplugs and you can have a full sleep before the race. And you can use the toilets as often as you need before the race. The hut is crowded with people and there is not much personal space. The beds are very narrow and it can be noisy with up to 20 people sleeping in the same room, nervously going to the bathroom in the middle of the night. You can cook simple meals, but realistically the best thing to do is to bring pre-cooked food with you that you can heat at the hut. Clothes: The average temperature in July at the Laugavegur is 7-8°C or 45-47°F. 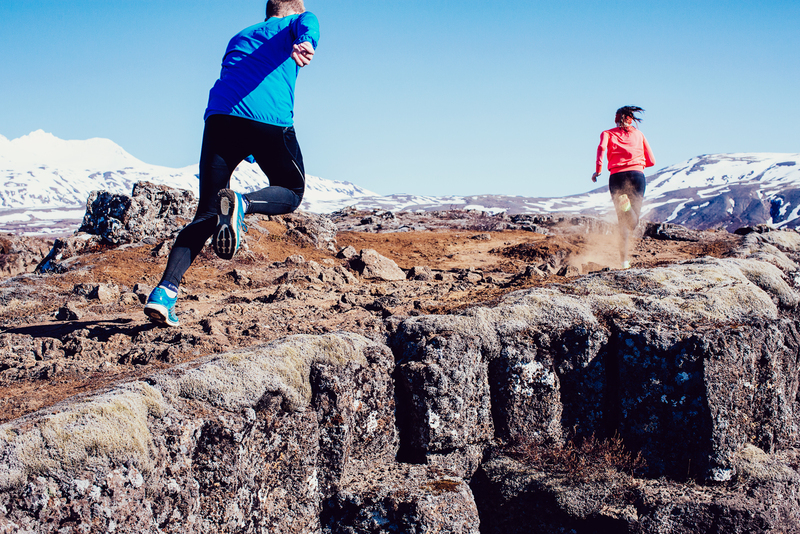 The weather in Iceland is very unpredictable so it is difficult to give advice regarding what to wear as it mainly depends on the weather forecast and your level of running. We have done this race twice (2011 & 2014) in two very different weather conditions. In 2011 the weather was very nice; sunny and a mild breeze. It is usually cold in Landmannalaugar and all the way to Hrafntinnusker due to the high altitude, but it gets warmer as you get closer to Thorsmork. In 2014 conditions were cold with both strong wind and rain. No less fun though! Shoes: Our preference for shoes are trail shoes with a good grip that can easily get rid of water as there are several rivers that need to be crossed. Other gear: Some people wear gaiters over their shoes to hinder stones to get into the shoes. You can either buy these or take and old pair of socks and make your own gaiters by cutting the toe box and the heel off, then take an elastic band and sew to either side. Extra clothes: We strongly recommend that you have an extra set of clothes, shoes, energy gel / bars, salt tablets (for cramps) and painkillers in a bag at the Bláfjallakvísl aid station. Most people try to avoid using this though, unless absolutely necessarily. It takes time finding your bag and sifting through it to find what you want. Look at it as an emergency kit. It‘s there if you really need it but don‘t plan on using it. Just keep on going! There are refreshment stations on the way. When you get there just pass your bottles to the station staff, they will be happy to fill them up for you. The Laugavegur staff are a very cheerful and helpful bunch, giving you a mental energy boost for the long road ahead. We recommend that you fill up your bottles at every drinking station, or when necessary – but keep in mind if you are racing for time that time passes quickly! If you want save a little time at the aid stations, run with one big bottle instead of many small ones. It’s quicker to fill up ! But of course you may just prefer the longer rest. It’s a good idea to use the bottles to help you when the going gets tough, not only by providing much-needed drink but maybe also by writing on them motivational quotes to get you going or your expected splits to avoid having to use your by then non-existent arithmetic powers. The best way to train for the Laugavegur race is to do a lot of uphill running or power walking. And of course long distance running, preferably with hills or mountains. For the average runner we recommend walking up the hills but of course it depends on your running experience and fitness. There are several rivers on the way that need to be crossed. There is no way around them so don’t waste time wondering, just to go for it! The race ends in Húsadalur in Thorsmork which is a really beautiful place and one of the most popular camping spots in the country. If you have the opportunity, staying one night in Húsadalur to celebrate with your fellow runners is a very good idea. You can either stay in a tent or rent a little hut. Your gear will be transported from Landmannalaugar to Thorsmork so just bring a tent and your gear to Laugardalur/Landmannalaugar and leave it on the bus. The Laugavegur Ultra Marathon is a great race, remember to have fun and enjoy the experience!